The kitchen is the heart and soul of a home, the room where family and friends gather to share friendship, love, life and of course, great food. Big, small, modern or traditional, it’s the place where memories are made. Today’s homeowners want a warm and welcoming kitchen that offers up-to-date functionality. At Foley, we help you realize the kitchen of your dreams by listening closely to your family’s wants and needs. Are you considering a kitchen remodel or looking for kitchen design ideas in Northern Virginia? Whether you’re looking to expand your existing floorplan, add a peninsula or island, or bring a modern touch to your kitchen’s design, our highly-experienced designers will bring your personal vision to life. Kitchen remodels are a big investment – one of the most expensive remodeling projects homeowners take on. Over the years we have developed a remodeling process that helps you stay on schedule and budget. We start by evaluating your family’s needs and then look closely at how the kitchen is used in your daily life. We take note of traffic patterns and the layout of the appliances, prep areas, and dining space. We then listen carefully to what you hope to achieve through the remodel. Together we determine the design and construction schedule required to create a new beautiful and functional space. Whatever your reason for remodeling, we’ll help you realize the kitchen you’ve always dreamed of. And we promise to do it with a minimum of disruption to your family’s life. What matters most to us is whether your finished kitchen will service your family in the long run. We take immense pride in being able to blend your remodel with the existing home elements. Your kitchen may be new, but it should fit in seamlessly with the rest of the house. As designers, we have perfected the art of mixing new and old, integrating modern features into traditional design. We think of our clients as family, and we hope they come to think of us in the same way. As family, we take our responsibilities seriously. We put ourselves in your shoes and treat your home as if it were our own. We believe in collaboration, so we’ll always share our thoughts and concerns, but understand the ultimate design decisions rest with the homeowner. We are here to serve you. We are proud of the people we work with, including the subcontractors we hire. 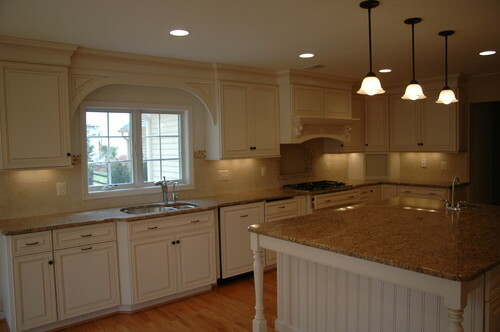 Our goal is to finish your kitchen remodel on time and to specifications. Whether we’re doing a small remodel or a major renovation, we hope you always feel as though your project is our top priority. From initial concept to finished construction, we want you to know just how much we value your trust in us. Think about what you need. Gather ideas from different resources, and think about your priorities for your new kitchen. Can you work with the existing footprint, or do you need more space added on? Do you want a stand-alone island, or a peninsula? Is there a gourmet cook in the family who needs professional style appliances? Research and plan. Sketch out a preliminary budget and scope of work. At this stage of the process, be realistic, but don’t be afraid to list all your dream features. Don’t put pressure on yourself to know what everything costs or what work is involved. This is the educational phase of the process. Fixtures and finishes. Whether in someone else’s home, in magazines, or on TV, you’ve probably seen a lot of kitchen features you love. Now’s the time to pull those ideas together and find a common theme – be it modern, traditional, or transitional. Start to think about cabinetry, countertop material, light fixtures, flooring and the like. The more ideas you can bring at the beginning, the better our team can deliver a design that reflects your wishes. Having at least a rough idea of what you want before the design phase begins will make the entire process go that much more smoothly. Ready to start? Let our design team get to work creating a new kitchen that your family will enjoy for years to come. Take a look at our site to learn more about who we are and what we do, and then contact us for a kitchen remodeling consultation. We look forward to hearing from you.